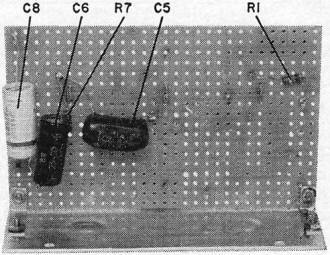 The introduction of field-effect transistors (FET's) into the electronics world was a major benefit to designers needing lower power consumption and perhaps more importantly, high input impedances for active circuits. The two most fundamentally distinct type of FET's are the metal-oxide-semiconductor field-effect transistor (MOSFET) and the junction field-effect transistor (JFET). Both FET types are voltage-controlled devices and do not require a bias current (hence the high input impedance) like a bipolar junction transistor (BJT) does. 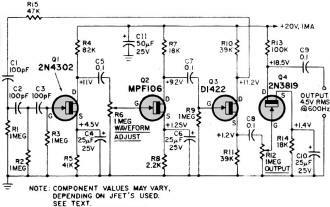 Neither FET type has a PN junction. A JFET uses a high resistance semiconductor channel region between the source and drain with an ohmic contact to the gate, whereas the MOSFET has a insulative oxide layer between the gate and the channel. Check out the links to each transistor types for more theoretical detail. I don't have Part 1 yet, but hope to be able to buy the May 1969 issue soon. 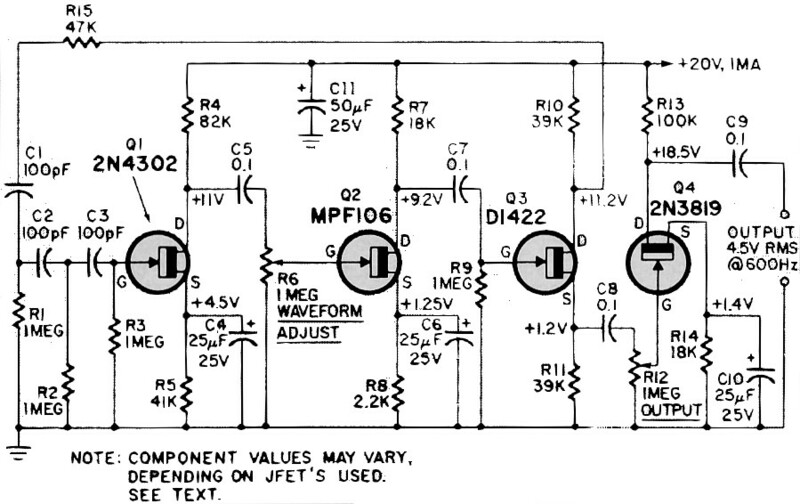 One of the most immediate uses of JFET's was in multimeters to achieve a high input impedance that imposes very little impact on the circuit being measured due to the voltage division effect. 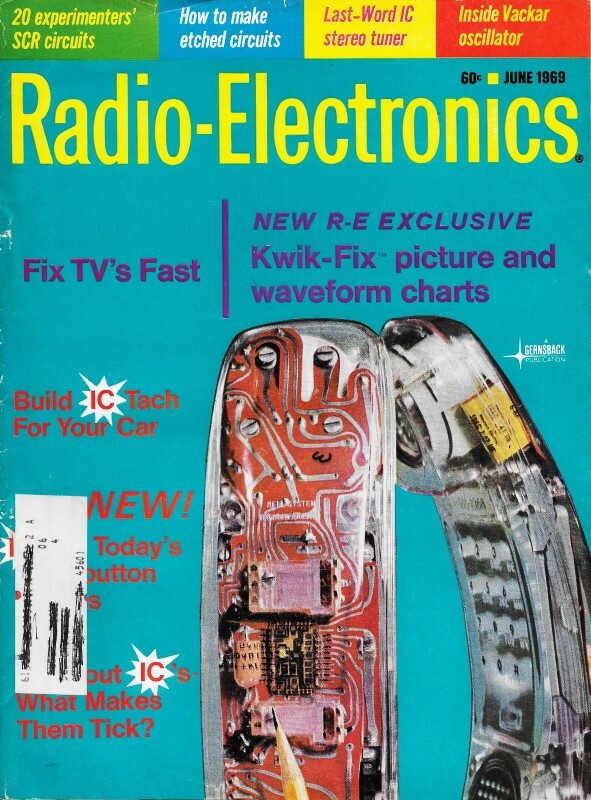 My first JFET multimeter was a Microanta (Radio Shack) model 22-208 purchased in 1978. 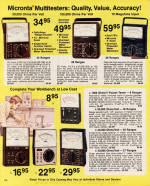 Its $59.95 price in 1978 is equivalent to about $225 in today's money (per BBLS Inflation Calculator). 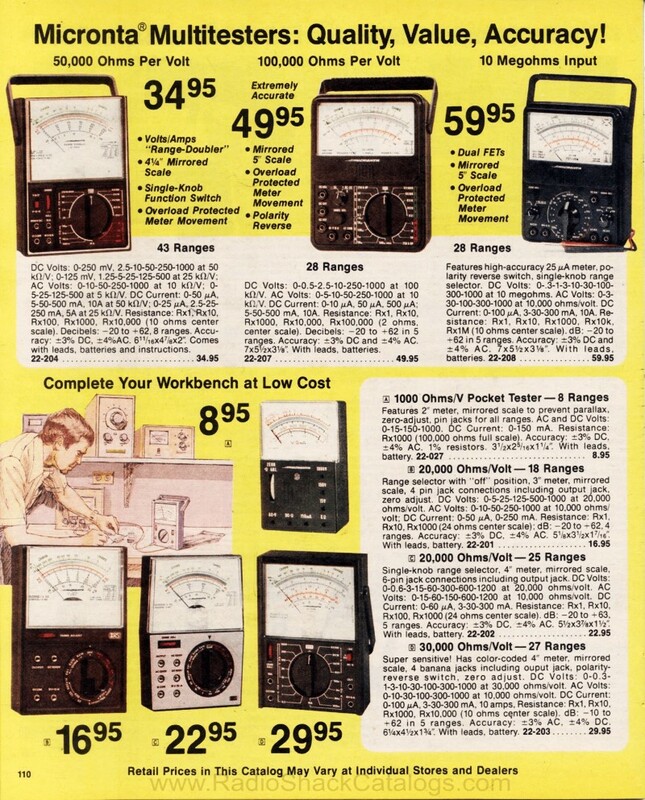 Looking at the 1979 Radio Shack catalog page, compare the input impedance of the el cheapo ($8.95) model 22-027 at 1,000 ohms/volt with the higher end ($49.95) model 22-207 at 100,000 ohms/volt. That means when a reading of 1 volt is displayed on the scale, the effective internal resistance of the meter is 1,000 ohms (1 kΩ) and 100,000 ohms (100 kΩ), respectively. If the circuit being measured (device under test, aka DUT) has an output impedance of, say, 10,000 ohms (10 kΩ), then the reading is equivalent to what would be indicated if an infinite impedance meter is used to measure the voltage when a 1 kΩ or 100 kΩ resistor, respectively, is placed in parallel with the DUT's 10 kΩ. In the former case, the altered output impedance being measure then becomes 10 kΩ in parallel with 1 kΩ (abbreviated as 10 kΩ || 1 kΩ), or 909 Ω (a 90.9% reduction). In the later case, the altered output impedance being measure then becomes 10 kΩ in parallel with 100 kΩ (10 kΩ || 100 kΩ), or 9.09 kΩ (a 9.09% reduction). The 10 MΩ JFET meter (10 kΩ || 10 MΩ) creates a reduction of only 0.1%. Proof of the preceding is left as an exercise for the reader. Last month in the first of two articles we looked at the theory and operating characteristics of a few junction field-effect transistors (JFET's) costing under $2.50. Now you should be ready to experiment with and build some practical devices using JFET's. You'll need an assortment of 1/2-watt resistors, a few 25-volt electrolytics and some coupling capacitors. Choose part values around those shown in Figs. 2 and 3. For ease of breadboard experimenting, I recommend a few perforated boards with push-in terminals. A bias box is needed, since bias is dynamically determined. 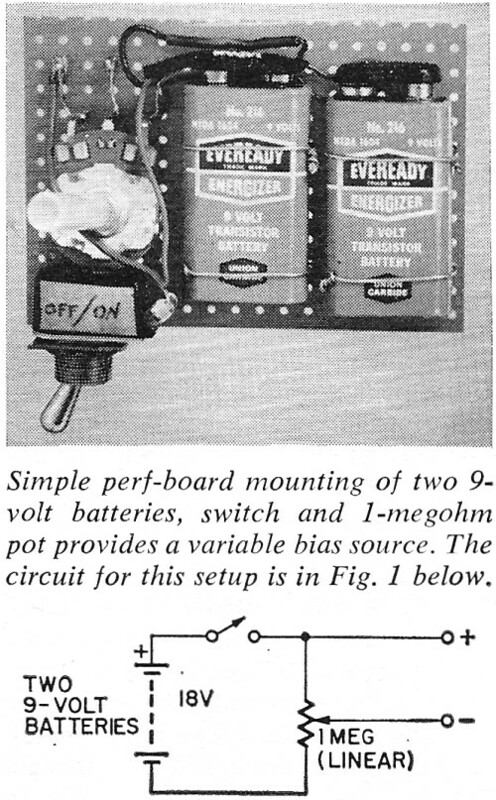 A simple arrangement using two 9-volt transistor-radio batteries across a 1-megohrn linear-taper pot, with a switch to save the batteries, is shown in Fig. 1. You'll also need a power supply capable of 20 volts and not more than 5 mA-batteries will do nicely. To test and design the circuit, you will need an audio generator. (A single frequency of between 400 and 2500 Hz is all you need, and output voltage can be quite low - 50 mV rms.) An oscilloscope is essential to observe waveforms, but need not have high-frequency response, since you'll be observing only the frequency mentioned above. A high-impedance voltmeter (vacuum tube or transistor) is essential, and a milliammeter is nice, but not essential. 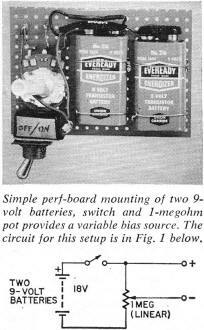 Simple perf-board mounting of two 9-volt batteries, switch and 1-megohm pot provides a variable bias source. The circuit for this setup below. 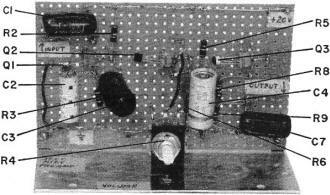 An easy but useful project is a simple preamplifier for a crystal or ceramic microphone. Fig. 2 shows the circuit, and here's how component values were selected and the first stage designed. 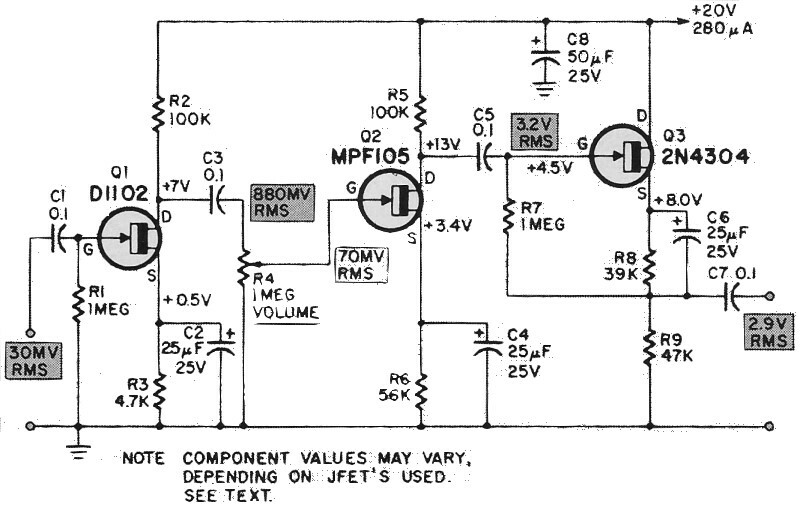 Like vacuum tubes, most JFET's work well with a gate resistor of 470,000 ohms or 1 megohm. Remember that the gate circuit is high-impedance and normally doesn't draw current. Thus, R1 in the input stage is 1 megohm. 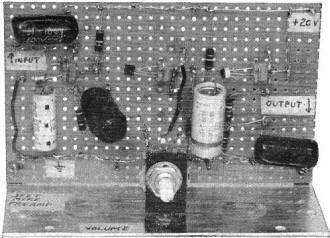 The drain-load resistor is also borrowed from vacuum-tube design. The greater the drain resistor, the higher the voltage gain (AV) of the stage. But distortion also increases with greater load resistance, and after a certain point the increase in AV is negligible. For the D1102 at Q1, 100,000 ohms is a reasonable compromise for R2. Coupling capacitors C1 and C3 determine frequency response and, for 1-megohm gate resistors, 0.1 μF provides best low frequency response. You can use 0.05 or even 0.01 with little noticeable loss of low frequencies. If you want only speech-quality response, use 0.005 μF. For source resistor R3, temporarily tack-solder in about 4700 ohms, and put the bias box in series (positive lead to source, negative lead to ground). This allows you to vary bias until you find the optimum value. Source-bypass capacitor C2 can be any value from about 10 to 50 μF, at 25 or 50 volts. It's simply a brute-force audio bypass around the source-bias resistor. Couple 30 mV of rms audio into C1 and the gate circuit. Set the bias box at 5 volts or more, and tie a power supply to R2, as shown in Fig. 2. The supply should be 20 volts, ±2 volts. Hang a scope across the output. (You don't need a load resistor yet, for the output is high-impedance and the scope loads the circuit. Note: Be very careful with JFET's. Use heat-sink pliers on the leads when soldering, and beware of transients, which can zap an FET in a millisecond. Normally a JFET shows resistance between drain and source, and vice versa. Between gate and either drain or source, it shows diode action (high resistance in one direction, low in the other). When zapped, the JFET loses its diode action from gate to channel, and shows similar resistance in both directions. With all systems go, decrease source-to-ground bias below 4 volts and watch the sine wave coming out of the drain. (Use a fairly decent amplifier and speaker to monitor that sine wave.) Juggle the bias around and observe the scope. Rear-mounted components for mike preamp. This perf-board arrangement lets you measure voltages and waveforms easily. Since component values vary, parts such as source-resistor R3 can be tack-soldered until the correct R4 value is determined. Fig. 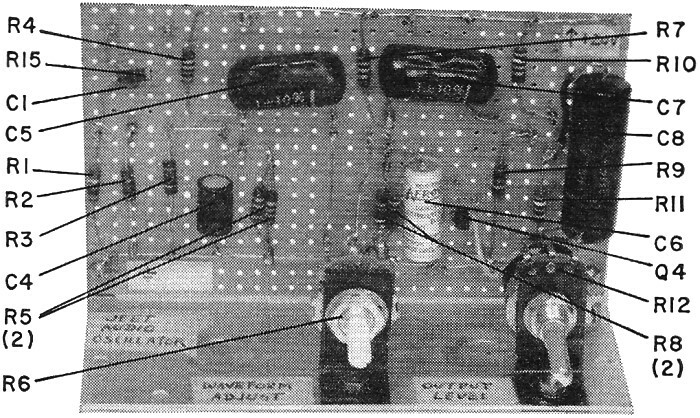 2 - Circuit for a JFET mike (microphone) preamp, which operates with 30 mV input from crystal or ceramic mikes. Overall voltage gain of the circuit is about 97. The JFET's listed in last month's Table I are inexpensive because their parameters aren't tightly specified. Thus the D1102 you use may have an IDSS of anywhere from 0.2 to 1.0 mA; the bias you end up using may differ from mine. I found 0.5 volt a safe compromise, and at this bias value my D1102 drew about 100 μA of drain­source current. By Ohm's law, 5000 ohms is required to cause a drop of 0.5 volt with 100 μA flowing. I chose 4700 ohms as the nearest 10% value (R3). Drain current then became 115 μA, which had no ill effect on the stage operation. The second stage - also common-source - can be designed the same as the first, but you must insert a volume control in the gate circuit or you'll overdrive Q2. More than about 70 mV rms into the gate circuit causes clipping in the output. The pot also allows you to increase or decrease gain to compensate for different microphones and distance between talker and mike. Fig. 2 shows values I obtained for the Q2 stage with an MPF105, which makes a fairly good medium-level amplifier. Other suitable devices are the 2N3819, 2N5163, MPF153 and TIS34. Output stage 03 is a simple source follower to provide fairly low-impedance output, which makes coupling to following amplifiers less critical than would a high-impedance drain follower. I used a 2N4304, but a D1201 would also be suitable. Both have a fairly high VP of 10 volts, which you want in a source-follower output stage, to handle wide inputs. The source follower is designed almost like the preceding common-source stages. The major difference is that load resistor R9 is in the source circuit, rather than in the drain. This being the case, and since it's desirable to have lower-impedance output, R9 is made 47,000 ohms instead of 100,000. This provides less voltage gain, but here you are working with a few volts, so gain is less important. When determining bias in this circuit, insert the bias box in series with R8 and R9, starting with about 4700 ohms for source resistor R8. Remember that the gain of a source follower is never greater than one. By the way, use decoupling capacitor C8 even if you use a battery supply. It prevents undesirable inter-stage coupling. If you do any experimenting with audio circuits, a small oscillator is handy to have around. The circuit of Fig. 3 is the basic design for a phase-shift oscillator using JFET's. Design is fairly straightforward, and is built around the first stage. If you are willing to spend more money, you can buy a JFET with low VP and high yfs (the 2N4338, for instance, which costs $4.95) and build the oscillator with only two stages. (In this case, omit Q2 and Q3, and tie C1 directly to the drain of Q1.) Unfortunately, none of the devices listed in Table I have both low VP and high yfs and none will sustain oscillation from drain to gate. Therefore two more stages are required to provide sufficient feedback. Here's how to design the circuit. Build stage Q1 first, temporarily using the values shown in Fig. 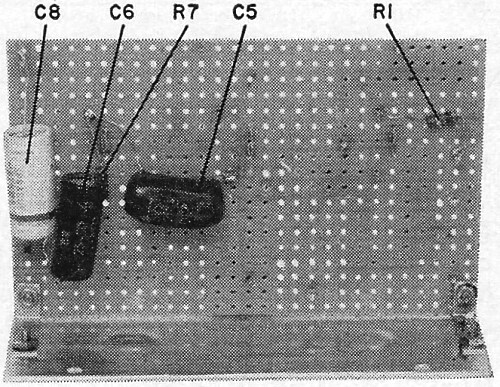 3 for feedback/phase-shift components C1, C2, C3 and R1, R2 and R3. (Do not connect R15 yet.) You can use 100,000 ohms for drain load R4 (I used 82,000 simply because I had run out of 100K's). Use the method outlined above to determine bias. 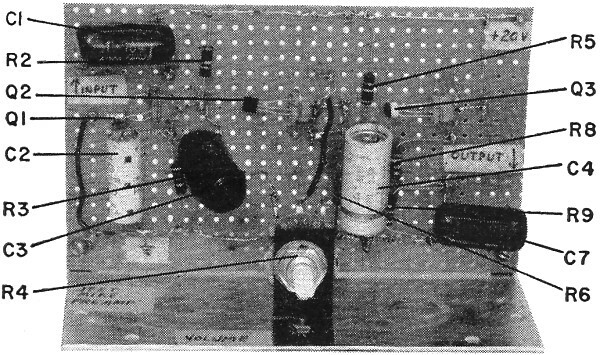 From an audio generator, feed about 1 volt rms into C1. Then provide drain-supply voltage and clamp a bias box to the source through any value from 1000 to 4700 ohms. Hang a scope and amplifier on the drain-output circuit and vary the bias until you get the most gain with the least distortion. Using Ohm's law, determine the value of source resistor R5. I used 41,000 ohms with the 2N4302. Other choices for this stage are the D1420 and E102. The gain of the Q1 stage will be about 30 (too much output) so a pot is needed between Q1 and Q2. Use a 1-megohm audio-taper pot, to match Q2's input. For Q2 I used an MPF106, and by trial and error determined that 18,000 ohms was a workable value for the drain load. Set the bias here as you did before, but don't overdrive the stage. I found about 35 mV rms from the arm of R6 was about all the stage would tolerate. 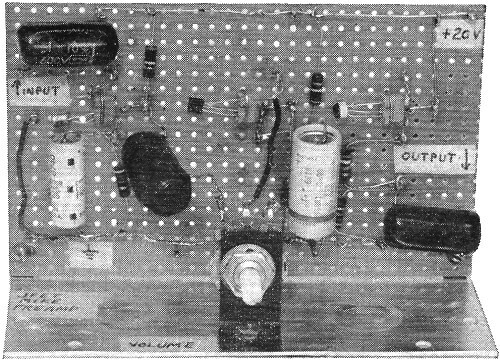 Later, this control is used to determine the cleanness of the oscillator waveform. The Q3 stage operates as a split-load, providing one output (from the drain) for feedback and another output (from the source) for output coupling. I used a D1422, but the 2N4304 and E100 will also work. Try a load resistor of about 47,000 ohms or less to begin with. Then strap in the bias box and determine the source resistor. If it's less than 47,000 ohms, change R10 to match R11. I ended up with 39,000 ohms in both drain and source circuits. By the way, you should still be using the external oscillator signal for setting up these stages. 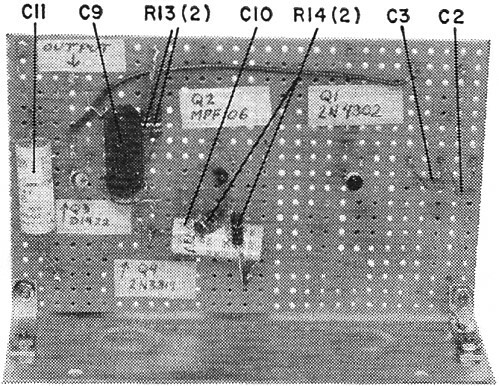 Rear-mounted components for audio oscillator. To build the JFET audio oscillator, Q1 is mounted and its associated components temporarily soldered to the push-in terminals. Best bias for Q1 and remaining stages is determined with the bias box. Fig. 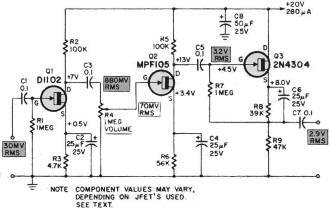 3 - This JFET audio oscillator produces clean single-frequency sinewave. The circuit can be made tunable by changing values of C1-C2-C3 and R1-R2-R3. Now tie the output of Q3 to RI2 - another 1-megohm audio-taper pot. Remove the external audio oscillator from Q1 and strap in feedback resistor R15. Try 47,000 ohms to start. You should already have set R6 so it's not overdriving Q2. Hang the scope across R12 and fire up the circuit. If the output waveform isn't clean, change R15. (But always turn off the power before you do!) Try less resistance, and if the waveform gets more distorted, you are going the wrong way. Cut and try until you find the optimum value. Don't use clip leads to try R15; the stray coupling will give you a false indication. Tack-solder each value of R15 in place, one by one. Once you get the oscillator itself working with a fairly clean waveform, build Q4. I used a 2N3819 because it has a high VP and hence can accept a fairly high gate-input signal. The MPF150 and 2N5163 would also be good choices. Transistor Q4 is simply an isolation stage, and you can assume 100,000 ohms for drain load. Set the bias as before, being careful not to overdrive the stage with the setting of R12. I got about 4.5 volts rms out of Q4 with a clean waveform from the oscillator. Set R6 for purest waveform, and after you build Q4 if you are doubtful of the oscillator, try another R15. You can vary R12 from zero output up to clipping, and you should find several volts of output. This output is fairly high-impedance, but if you prefer low impedance you can make Q4 a source-follower stage. You won't get as much output, but you'll be able to use a longer output line and match low-impedance inputs. Oscillator frequency is determined by R1, R2, R3, C1, C2 and C3, and is about 600 Hz for the values I used. The exact frequency is given by the formula f = 1/10.88 RC, where f is the frequency in hertz, R is the resistance of R1, R2 or R3 (all equal value) in ohms, and C is the capacitance of C1, C2 or C3 (all equal value) in farads. Note that this formula holds only if resistors and capacitors are 1% types. I used 10% types and came up with 600 Hz, rather than the frequency that was originally computed: 920 Hz. If you build this circuit on a metal chassis, use a single ground-return bus insulated from the chassis. Tie the bus to chassis at one point only - the junction of R1, R2 and R3. If you want to make the oscillator variable in frequency, sharpen your pencil and compute the values of R1-R3 and C1-C3 for the frequencies you want. I suggest using a three-gang capacitor and switching in various resistors. Use straight-line parts layout and short leads, and put the circuit in a metal box where it won't be affected by stray capacitance that could alter the frequency. The methods outlined above are, of course, very simple. They are meant to show you how to use JFET's in construction projects. By experimenting with these devices, you will become familiar with them. Then you can go on to more sophisticated designing. Because of the spread in JFET parameters, those who design circuits for production line use must safeguard against device-to-device variation in yfs, IDSS and VP , They do this by using lots of feedback and sophisticated bias networks. They also compute drain loads and bias values more exactly, to allow for temperature and power-supply variations. After you get the feel of JFET's, you may want to collect some specification sheets on various devices and read up on more of their characteristics.